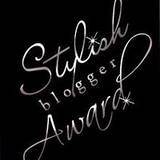 A huge thank you to Stephanie at Henry Happened for giving me a Stylish Blogger Award! You can't imagine my surprise when I read I had received this. Thanks again Stephanie! It is very much appreciated. First off, I not sure I can really think of seven things about myself but I'll try. I have two beautiful little granddaughters whom I LOVE very much. I'm a member of the Romance Writers of America. I love reading and writing--especially romance novels. Several years ago, I wanted to open my own gourmet dog treat bakery. I was going to name it the The Barkery. I'm addicted to my DVR. I think it's the best thing to come along since sliced bread. Now I never miss an episode of The Real Housewives or The Bachelor. You gotta love that! I have the most AMAZING daughter ever. Thank you so much for considering me. Thank you so much fo the award and for visiting my blog! I can't wait to check out some of the others that you've awarded as well! Congratulations on your award, you deserve it! Your blog is beautiful! I am stopping by from I ♥ Blogging, I wanted to say thank you for joining our hop!